The reviews for Holmes Volume 2: The Return of Boro’s Greatest Detective have started coming in on Amazon and I'm chuffed to say it has scored a perfect five out of five for the first five reviews. As I think i've said before, given the excellent feedback I recieved for Holmes Volume 1, I did have a niggling doubt that Volume 2 might not be so well recieved. It turns out that was just the natural anxiety that most writers probably feel. Mel, writes a funny and clever book that all people should buy a copy, not just in Teesside but far and wide! Great follow up to the First volume. More nods to the classic Holmes stories whilst making the characters come alive in a different environment. Vol 1 was great, Vol 2 is even better! Holmes vol 2 has pulled an "Empire Strikes Back" and improved on a fantastic debut. I loved vol 1 and vol 2 is even better! Great stories and further depth to the characters, complete with some emotional rollercoaster moments, made for an excellent read. Highly recommended!! Thoroughly enjoyable read. As with Vol.1, stories seemed to grab me more and more as I got further and further into the book. The Orb of Ironopolis.... a favourite. Liked the backdrop of dreams, refragmentation, computer architecture... exploring the way the mind and memory might just work. Eleven out of eleven. 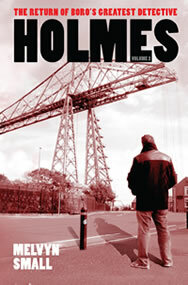 If you would like a copy of Holmes Volume 1 and/or 2, Guisborough Bookshop now have a stock of both books.